PRESTO!™ PREP™ is SIMPLY AMAZING. 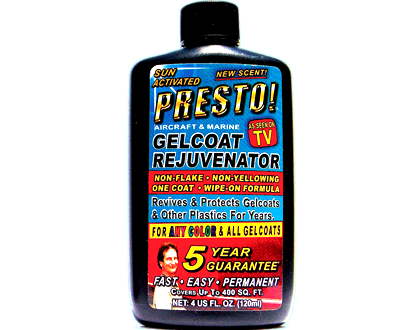 PRESTO!™ PREP works right before your eyes with little or no effort, just apply, wait and wash-off - simple! Really heavy duty cleaning may need some light scrubbing. PRESTO!™ PREP is sold as a concentrate. Other cleaners are mostly water. 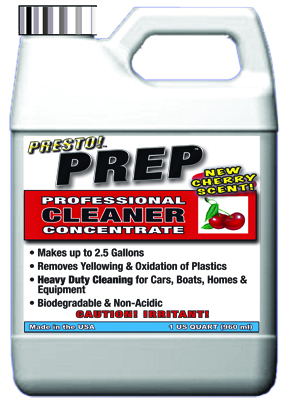 PREP!™ is a 100% cleaner concentrate - NO WATER. Why would you want to buy water you can get from a nearby tap? Why pay to ship you water? PREP™ actually costs less than yet does more than other cleaners. PREP™ comes in an 8 oz. (US), BLACK, HDPE, Flat Oval bottle with matching black cap and a heavy duty heat seal. The cleaner is so crazy effective that it gives us trouble sealing the bottle! PRESTO! PREP™ is the only product we know of that instantly washes the yellow out of car headlights without the risk of melting your skin. To wash out the yellowing from headlights, use PREP™ at full strength, no not dilute it. You actually see the yellow start to wash out of the headlight on contact. For other uses, follow dilution directions on the label. PREP™ eliminates all of the sanding normally needed to get the yellow out of headlights. This also eliminates the risk of sanding a hole in the headlight while you try to sand out the yellow. This is the secret to how we can recondition a headlight in less than 5 minutes. After you use PREP™ to get the yellow out, you then use PRESTO!™ PBR™ to permanently penetrate, seal and protect against further weather damage. PREP™ easily pays for itself the first time you use it. Thank you for your purchase and supporting a small company based in Cleveland, Ohio • USA!